I must admit I have taken on a personal hiatus from the weekly photo challenges as of lately. Truth be told, I couldn’t wait to create a collage of images that helped define what 2012 was for me. I’m still going through the thousands of photos I’ve collected in the few hours of free time I get to play on my computer, so I’m not going to ask anyone to hold their breath on that. But for this week’s photo challenge of Illumination I have chosen one of my favorite photos of men playing a game of dominoes in an empty arcade of a classic, colonial building in La Habana, Cuba. This scene was stumbled upon in a walk around the aesthetically overwhelming city full of friendly Cubans in late afternoon in Spring. 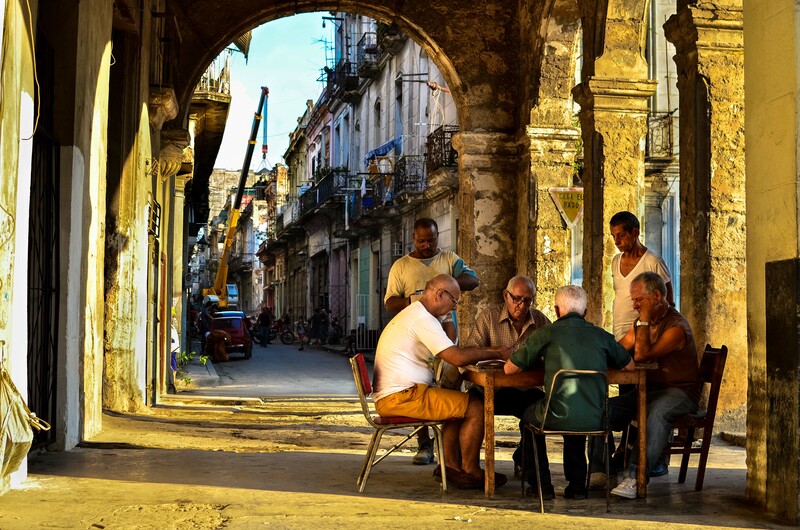 The yellow sunlight was pouring through the arches while men of all ages, surely full of different life experiences growing up in Cuba played while two curious beings watched on. Although they are actually in the shadows of a pillar, the sunlight around them illuminates a common scene in a country where retirement means living even more simply on almost nothing at all. The worn out military issued clothing, taped glasses, saggy shirts, and boots way past their expiration tell a story of how life on the island is for the common folks. The sunlight bouncing off the smooth concrete floors and walls reflects light back into the shadows, lighting up the scene that really caught my eye. In the background a large crane is surely either repairing or taking down a former residency, building the way for more tourism that is helping to feed the struggling economic woes this Caribbean country has. I love this. There is so much richness to this photo – from the people to the buildings. Simply gorgeous. Thank you very much. Cuba is a magical place, but also a very real one. I think that everyone could find something they would cherish and take back with them by visiting. Thank you very much for the feedback. Cuba is simply gorgeous. You couldn’t have picked a better illustration of illumination…not only from a photographer’s perspective but from a historical perspective. How many of us have been to Cuba? Love the texture and rich warm colors. The answer is not enough. Although I must say there were plenty of American’s roaming around the streets of Habana. Cuba has a very warm persona that I think comes through in most of the photos taken there. Thanks for stopping by again! I love the photo. Congratulations. Thank you very much. Congratulations on…? I love the light in this photo. All of your photos with people in them are very good, some of them like peering into the souls of the people. That is what I strive to achieve when I shoot an image with people. I want to try and show a piece of who they are with a photograph. Thank you for commenting! That is a really cool photo. Cuba is so photogenic – I’d love to get back there. Very photogenic. Get back there soon! Thanks so much for giving everyone an update on this subject matter on your blog. Please know that if a brand new post becomes available or in the event that any adjustments occur with the current write-up, I would want to consider reading a lot more and finding out how to make good using of those methods you write about. Thanks for your time and consideration of others by making this site available. I really love your blog, your work, your narrative, your photography, everything! Thank you very much. I’ve been slacking a lot lately, but getting back into the swing of it. Thanks for commenting! J’aime beaucoup votre photo ! De magnifiques couleurs…. ! Thank you for sharing Cuba with us.